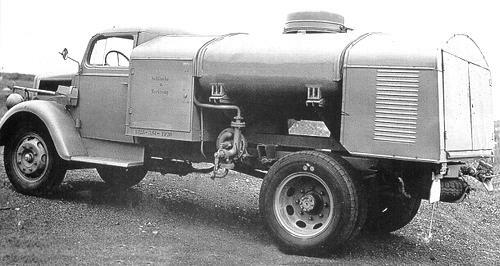 The 3 ton Opel-Blitz truck was first introduced in 1936. In 1939 Opel changes a small but significant detail: due to complains from the dealers about the number of wheels being broken by customers, Opel raised the number of nuts from 6 to 8. The curve in the wheel and the number of holes in the wheels was changed with it. All Blitzes built after 1939, including 4x4 “A” type, Maultiers, and all special military vehicles, had 8 hole wheels. This set presents correct 8 nuts wheels for rear-drive 4x2 3000S type. An Opel-Blitz 3000S 4x2 rear-drive Tankwagen with 8-nuts War-Time Wheels.